Printed on a linen and rayon fabric with a luxurious texture and beautiful drape, Ankara Lined Tailored Swags are sophisticated in both pattern and color: the updated Jacobean design showcases a stunning color palette of greys, muted gold, and off-white against a charcoal background. These beautifully constructed swags will enhance both formal and contemporary decors. 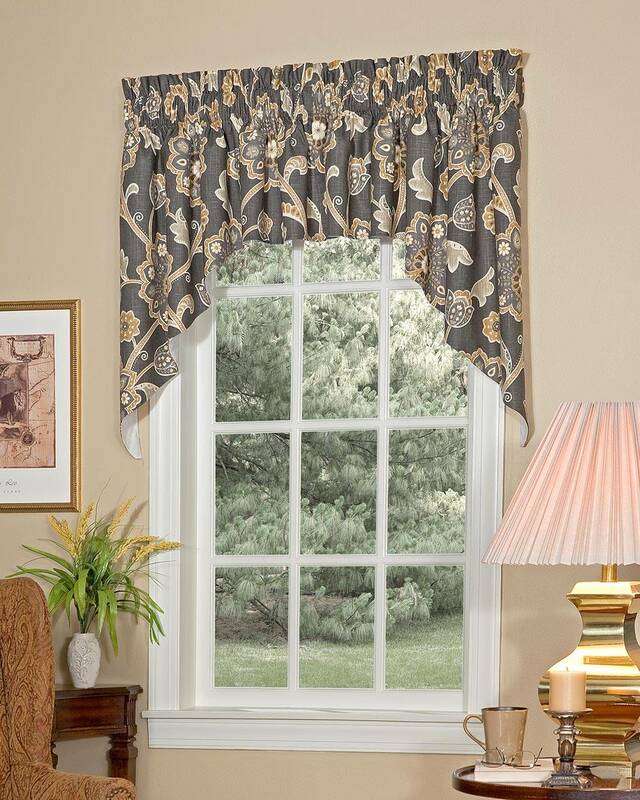 Hang alone for single windows up to 60" wide (as pictured above) - or combine with Ankara Lined Tailored Insert Valances to cover wider windows. (Insert valances between the right and left swag panels.) Fully lined for protection from harsh sun. A Pretty Windows exclusive, Ankara Lined Tailored Swags are made in the USA.